Some of you may have read about my Buffalo Chicken Ravioli attempt-turned-fiasco in part one of my interview on Skinny Jeans, Fat Wallet last week. They can’t all be culinary masterpieces, folks. Luckily, I still had Buffalo chicken on the brain so I decided to take a different approach. Now this was a success. The panko forms a crusty coating for the shredded chicken inside, nestled amongst creamy cheeses and spicy wing sauce. All these flavors come together in each perfect bite! I can’t help thinking that with football season back on and soon approaching, these bites would make a great finger food for game day. You can serve them on their own or with some blue cheese dressing for dipping and some celery and carrots on the side. 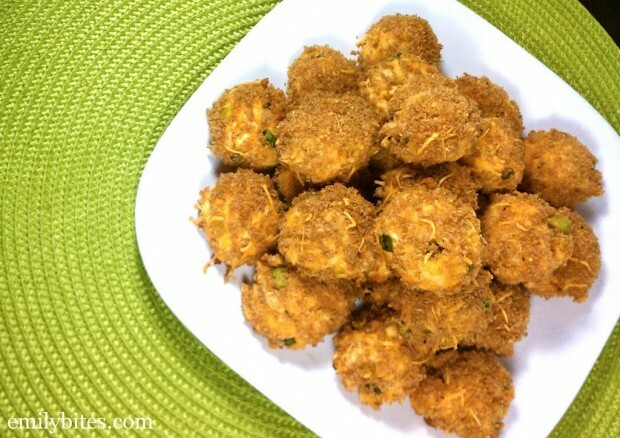 Maybe if every one of my readers serves Buffalo Chicken Bites on Sundays during football season the Buffalo Bills will win more than four games this year! Maybe? Please? Hm. Well, you really should make them anyway. Can’t hurt to try. Preheat the oven to 350. Lightly mist a baking sheet with cooking spray and set aside. Fill a large pot with water and bring to a boil. Place the chicken breasts into the boiling water and boil, uncovered, for 15-30 minutes until cooked through. Remove chicken from the water and shred using two forks. In a large bowl, combine the shredded chicken with the wing sauce, cheddar, blue cheese, scallions and cream cheese and stir together until thoroughly mixed. On a sheet of parchment paper or other flat, nonstick surface, separate the chicken mixture into 24 equal piles and then role each one into a ball. In a shallow dish, combine the panko crumbs with salt and pepper and mix to combine. Roll each ball of chicken in the panko, coating the outside, and place it on the prepared baking sheet. Spray the tops of the panko-coated chicken bites with cooking spray and transfer them to the oven to bake for 20-25 minutes until panko is slightly browned and crunchy. i am so making these!! thanks for the yummy looking recipe! I gotta say, they look kind of hairy! But after taking a look at the ingredients, my mouth is watering. Can’t wait to make them! these look great! i love panko (could tell from the wonderful picture that’s what you used) but i’ve never used Ian’s whole wheat, only Kikkoman’s. I’m guessing Wegman’s since Top’s discontinued a bunch of the Ian’s frozen organics that my kiddos liked! Yes, I found it at wegmans in the nature’s marketplace section. Oh my gosh I want these! I have to finish my buffalo chicken wontons in the fridge but this will most definitely be my next buffalo chicken recipe!! Do you believe in fate? Last week I made a big batch of chicken for shredding to make some enchiladas. I only used some of the chicken and have tons left in my fridge. I just came on to see if I could find any recipes to use up the rest of my chicken. Lo and behold, this was the first thing on your page! Gonna have to try these tomorrow! what’s the dip you have shown in the picture? It looks like yogurt or sour cream? I thought maybe I could add some blue cheese crumbles to greek yogurt. It’s not ranch dressing is it? 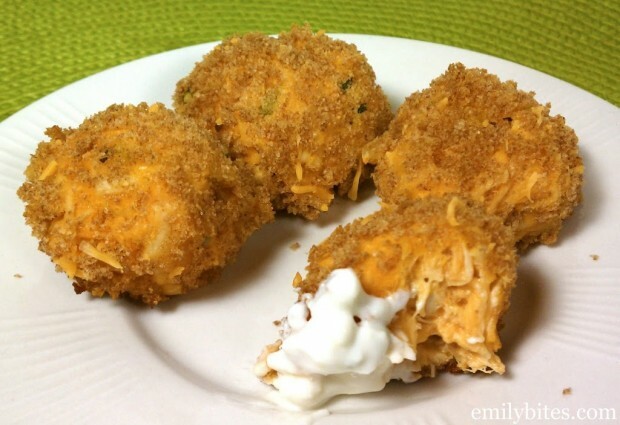 The dip in the picture IS actually greek yogurt mixed with blue cheese crumbles and a few extra things (ingredients found in the original recipe I modified here: http://backtoherroots.com/2011/08/11/baked-buffalo-chicken-bites-with-blue-cheese-yogurt-dip/). Good eye! I thought the dip was okay. I chose to post my adaptation without the dip recipe because I personally thought it was worth it to just spend the points and have a small serving of real blue cheese dressing like Marie’s (mmm) instead. I also added some crumbled blue cheese to the actual chicken bites so that they wouldn’t even need dip to have that flavor if people wanted to eat them plain. The yogurt/blue cheese dip wasn’t bad or anything, it just wasn’t a good enough substitute for the real thing, IMO. If you want to make it though you should totally go for it! I am probably just a blue cheese snob :). haha excuse me, I had no idea about the aberration of mixing buffalo with ranch. lol Sorry. I am serving this to non-weight-watchers as a healthier alternative to “let’s grab a pizza”. But I’m not going to buy blue cheese dressing just for that. I think I’ll use blue cheese crumbles and greek yogurt if I do a dip at all. I think I’ll make a couple other of your finger-friendly recipes too. i found your blog via a WW board and all your recipes looks amazeballs can’t wait to try them!!!! You all make me miss Buffalo, with all your Bills, Wegman’s, Tops, and Anchor Bar talk! We lived in the area for 6 1/2 years before moving back home. Thanks for another great Buffalo Recipe! These look so good! I am a huge fan of everything buffalo chicken! Thanks Kevin, you should try them! Thanks Weaver, let me know what you end up making! Thanks Liz! The points listed are the new Points+ values. I made this on Saturday for my parent’s Anniversary party and they were a hit, I tripled the recipe to have enough and they were gone in like 20 minutes…next time I’ll have to make a ton more! Thanks for the recipe! Thanks for the recipe! Made these to snack on during baseball game and they were a big hit. I made these with my boyfriend a few Saturdays ago and now he wants to make them every weekend! I live in Chicago but luckily a friend brought me a bottle of Anchor Bar sauce from Buffalo. Thanks for such a yummy recipe! Hayli – Sounds like a good friend :). So glad they were a hit with you and your boyfriend! I am totally making these tomorrow for the OSU @ Michigan game! Thanks for the great low point foods. I make stuff from your site all the time! What would the point value be if you swapped out the blue cheese and cream cheese for Laughing Cow Blue Cheese wedges? How many wedges do you think it would be? I am so making this this week. May use turkey! Thank You so much for your great recipes. I made these for a surprise brunch for my grandma. This recipe is SO awesome. Super easy and spool yummy. I will definatley makes these again soon. 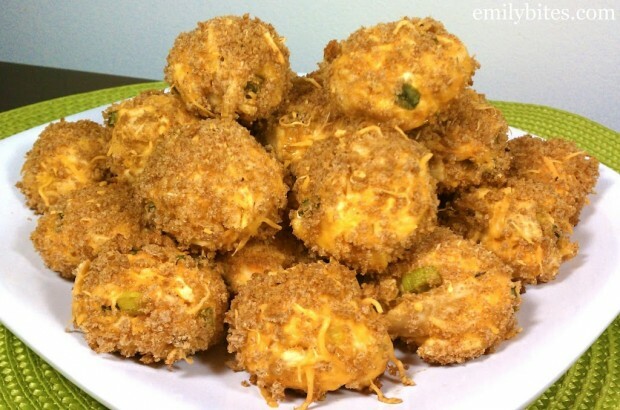 AMM – they’re great game day food! Hope they were a hit. Anonymous – I don’t really know how many to use since I didn’t make them that way. I ran it through the recipe builder with 6 LC wedges (just a guesstimate) in place of the cream cheese and blue cheese and it was still the same P+ per serving. These were another hit at my house! My 10 year old absolutely loved them, even though I thought they might be a bit spicy for him. I made a half batch for the three of us, using about 3 T of wing sauce. I also had good luck rolling the balls and refrigerating them for a while before rolling in the panko and baking. This was a great football snack! Thanks! Lori, I’m so glad they were a hit! I made these for a Superbowl party and they were a big hit! I cooked them in an aluminum pan because they traveled easier but next time I will make then on a baking sheet so they can brown better. I loved the blue cheese flavor…it was just enough to offset the 1/2+ of Frank’s buffalo hot wing sauce that I poured into the bowl! I’ll definitely be making these again! Maybe for a gathering this coming weekend since I have lots of blue cheese left over! These are great! We didn’t get your points plus value though…mine averaged out to 3 points per chicken ball. Sadly I didn’t notice that until after I ate many of them. But DELICIOUS and a worth indulgence. Oh, and we left off the blue cheese. Glad you liked them, Laurie! I entered into weight watchers using just 1/3 cup of hot sauce and got 5 points for 6 servings. It might depend on your wing sauce that you use. Delicious recipe. Made these last night and they were WONDERFUL! My fiance said he could eat 50 of them 🙂 I have 2 young sons (ages 9 and 2) who don’t like buffalo sauce so I substituted fat free ranch instead and omitted the blue cheese crumbles for them and they loved it. This recipe has been starred and entered into my recipe book! These sound great! I’m wondering if they can be made ahead of time? I was thinking you might be able to make them all and freeze, then bake when ready to serve. What do you think? Do you think the laughing cow bleu cheese used in the cupcakes work just as well instead of crumbles. Maybe use less cream cheese? I LOVE the cupcakes so would like to try these. I made these last night, and all I can say is, OMG, delicious. I will definitely be making these again and again. Thank you for posting this. Hi Emily! I’m looking for snack recipes to stick in the freezer. Do you think I should bake with the breading, freeze and then reheat? or freeze with or without the coating and then bake?